I mentioned in a previous entry that the mid-Sukhumvit area in Krungthep (Bangkok) used to be on the outskirts of town, home to the weekend homes for well-off residents of Rattanakosin Island (the old city) and Yaworat (Chinatown). Here is a perfect example of the type of home from the 1950s and 1960s that were quite common on the sois of Sukhumvit. This is the house located in Sukhumvit Soi 12 on the same property as the Crepes and Co restaurant that we enjoy having brunch at. The house could be described as “modern Thai tropical” and is typical of the old houses in our neighborhood including the one that was just torn down behind us. This is taken one morning in the summertime probably sometime around 1990. The row of elm trees branching over the street provides nice shade, a look that I associate with midwestern suburbs. 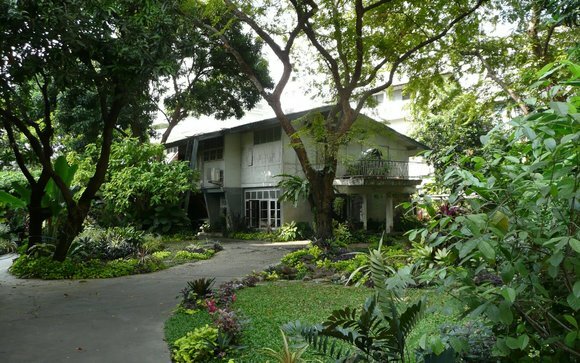 I lived in this house for fourteen months before moving to Thailand and while I was disappointed by the lack of good sunshine for a garden (except in a small plot in the back), I really liked the shade afforded by the trees. Whether in Thailand or in the US, I’d like to live somewhere with nice shade trees. Or vines. This entry was posted in Uncategorized and tagged house, Housing, Land, Shade, trees by christao408. Bookmark the permalink. I like the feel of the house. The houses in my hometown also pretty much feels the same; every house will have a couple of mango trees, one or two jack-fruit trees and many, many coconut trees. My parent’s house is also surrounded by trees. I find that the trees provided a pleasant, clean scent for the neighborhood, instead of the noxious LA fumes. Trees are inviting. We never knew what our trees did for us until we lost 2 of them – old maples. They drank so much water that they kept the basement dry, afforded shade in the summer (reduced cooling bills), and a wind break in winter (lower heating bills too). After they were gone OUCH! We have replaced them but we couldn’t use maple trees (a fungus killed them). Now we have a Bradford Pear and an Apple – not as big but pretty in the spring. I love big trees. I mostly grew up between two neighborhoods where the land had basically been almost totally cleared of big trees and I think the lack of trees really made me crave being surrounded by big trees. 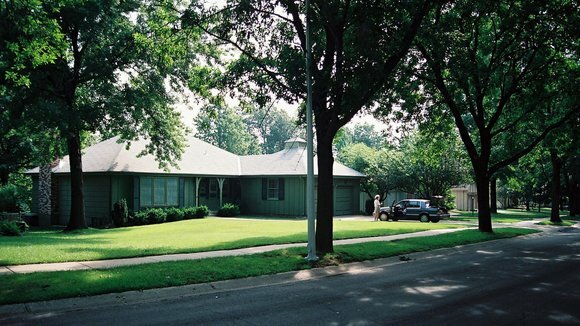 When Phil and I are ready to buy a house, we’ve already come to the conclusion that we want to live in an old house surrounded by a lot of trees. The top photo looks like it could have been taken here in Hawaii as well. This is pretty much what our neighborhoods look like. Well, at least the ones further away from the city; and not in a block of modern neighborhood that looks like it was carved out of Orange County and transplanted here. My parent’s house had a huge tree that provided a lovely shade during the summer. They spent a lot of time outside enjoying tea, reading or just chatting away. If I had a house, I think I would want something similar…. and a porch too. @ElusiveWords – A porch is a must. Growing up in California, the ability to dine outdoors is something I really appreciate. Tawn and I have a small table and chairs on our balcony and now that the weather is pleasant, afternoon tea is a regular thing. @arenadi – @Dezinerdreams – No surprise, of course, that the Thailand properties are similar to those in parts of India and Hawaii. It is a design that is well suited to warm and humid weather… and mango trees! @TheCheshireGrins – Interesting how a lack of trees creates a desire for them as you grow up. @yang1815 – FTW? @murisopsis – Are the new trees actually fruit-bearing? @Rm2046 – Trees play no small role in improving air quality, I’m sure. Imagine how much we need the trees here in Bangkok, then! @Wangium – This first picture or the second one? The second one is in a US suburb! FTW – “for the win” see http://www.urbandictionary.com/define.php?term=ftwA better response would have been FTW WTF? @ElusiveWords – I so would not have ever guessed that. @Wangium – It does look like a bit of a southern estate, doesn’t it? Trees and grass make for such an inviting place. Both these homes have that look about them. @yang1815 – How come you and Matt know how to talk like that? @ZSA_MD – Add to them the pond and flowers at your house and it is an especially nice look, right? @christao408 – It sure does. @christao408 – yes, and edible if you are a squirrel or bird. They are about the size of my thumb (and I have little hands).